MUFF WIGGLER :: View topic - planning on building the tetrazzi paper circuit. planning on building the tetrazzi paper circuit. So I have been talking with pugix about his modular tetrazzi project and he suggested that I put this conversation out in the open. Basically I am interested in making the modular version but I don't want to cut out the tetrazzi that I have built already (and put a lot of time into the case as well.) 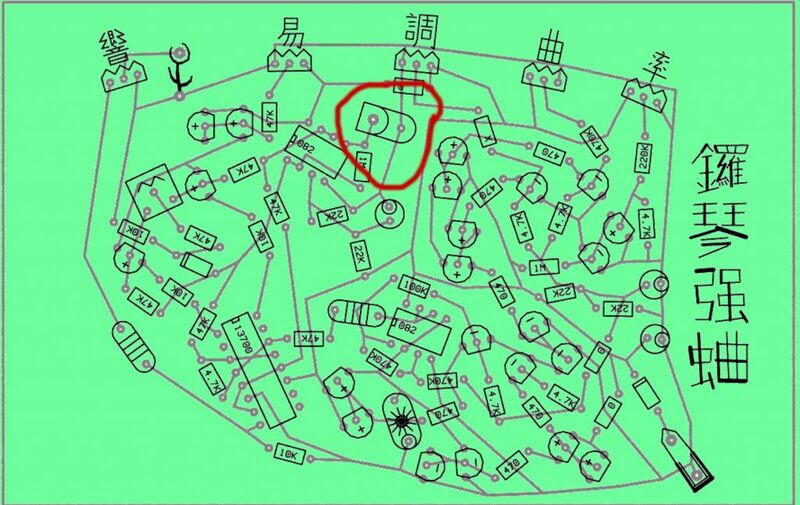 So looking at the paper circuit, it seems like there are the usual amount of idiosyncratic symbols, weird connections and blah that we have come to know and love from a Peter Blasser schematic. I thought if anyone else is interested in this project maybe we can put our heads together and dissect the circuit and maybe see what kinds of mods we can come up with for the modular version. For some reason when I have html code in my forum post the entire post disappears, so please just go to the sites listed manually to view the pictures and stuff until I can talk to a moderator to fix this issue. the circuit in the middle seems to be the VCA. looks like there are 6 connections to the main stereo outputs of the board. However, each voice also has 4 connections to the stereo outputs on the board. Are these the saw outputs of each individual voice? The 084 circuits sandwiched between the top and bottom voices are the scroll circuits. According to the next schematic, those "castle" button symbols are where we access the VCO inputs. They also have a strange spiral symbol on them that is repeated in the other voices. I wonder if those have to be connected together? The hexagons are all connected to the hexagons that have the same label. These also appear to be the CV inputs for these controls, although im not sure if that means that UPTON and DOWNTON are controlled seperately from the pitch of the voice? There are four cross connectors and four spikey connectors for each voice. Perhaps this is the internal nodespace that Richard refers to for the cross modulation controlled by upmod and donmod? Extra black lines seem to indicate traces that dont overlap. Next to the 082 clossest to each pot there is a symbol that looks like a little bullet, who knows what that could be? That's all of the wierd stuff I could find, let me know if you catch something else! So I am considering doing something else in order to preserve the random voltage generator circuit but have it just be another voltage source that can have its button pressed by a trigger voltage. My thought is to disconnect the top circuit's output and build the bottom circuit on the suplementary PCB. Then I can drive the scroll circuits button with some kind of transistor switching/ gate circuit. Richard mentions that the paper circuit will inevitably face more cross-talk than a PCB, so I am considering etching a PCB for the task. A friend of mine has access to a laser cutter at his work so I can get him to cut it. I think possibly making this circuit in 2 PCBs will save a lot of space because this thing will be stuber-sized if I make it as-is. Stacking 3 circuit boards is messy but more economical in many ways. I hope some others are interested in collaborating on this project. I know how crazy it is but hey I think we got into CL gear because we are a little crazy. My skills are not there yet, but whatever I can contribute I will try. I am excited and hope that a PCB can come out of this project. At one point Peter offered the Tetrazzi board and these extensive instructions, including the schematics. Funnily enough, just today I started on my Tetrazzi kit that has been waiting to be built for a long time. And here I find this thread. I intend to take inspiration from the tetrax and will post back info as I progress. Im a slow worker. Why not ask peter if buying just the tetrax board pcb is possible?? Tetrax is bigger and more full featured, while the old tetrazzini of yore is much more simpler and easier to navigate and convert to modular. If you check on the Nabra Users Yahoo group, I recently uploaded a fixed version of the paper circuit. It is layer-separated like the other paper circuits so that the traces are most visible from the bottom side, and the parts on the top side. Also, there are a few connections around the ICs which needed to be tweaked. I didn't post it here because the file is too large for the boards image uploads, but I am happy to email it to you if you want. Looks like a piezo to me. Inside signal, outside ground. It's like a little slice of a piezo disc. Hi, i really want to make the Tetrazzi!! can you please the boards image send me ? ?